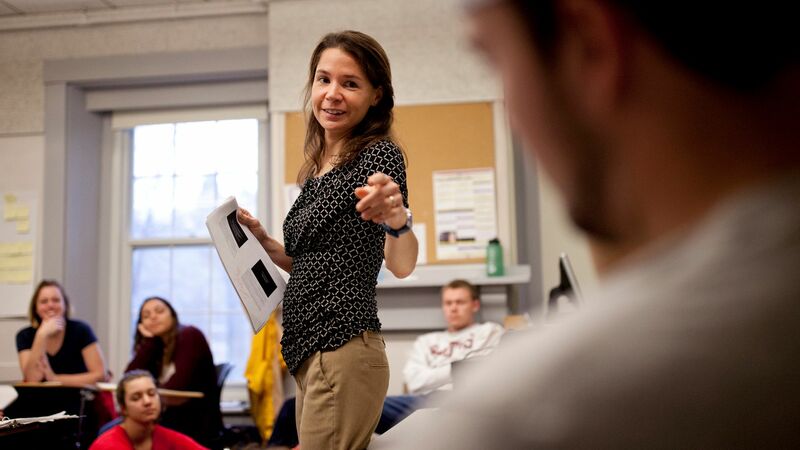 The Bates Department of Education offers two minors in education for students interested in connecting their academic interests in a major discipline with the field of education: Education Studies and Teacher Education. Students interested in designing a minor in education are encouraged to come to information sessions offered twice during the academic year and to make appointments with education faculty for early planning and advisement. Students who wish to pursue a minor in education in either Teacher Education or Educational Studies should begin planning their course schedules no later than the sophomore year. With early planning, they will be able to meet all requirements for a major and a minor and spend some time in off-campus study as well. Those students interested in certification need to think about how to manage the demands of student teaching in their senior year with their coursework and thesis. Minor declaration deadline is March 1 of sophomore year. Students interested in declaring the Educational Studies minor must complete the Education Studies minor application as well as all forms/pieces/essays that are due with the application by March 1 and meet with any Education professor prior to this deadline. Students interested in declaring the Teacher Education minor must complete the Teacher Education minor application as well as all forms/pieces/essays that are due with the application by March 1 and meet with Anita Charles, Director of Teacher Education, prior to this deadline. Interdisciplinary majors who wish to include education among the fields in their major must meet with and secure the agreement to advise from an Education professor prior to March 1 of sophomore year.